No weigh down. Irresistible softness. Luxuriously smooth.A luxurious yet lightweight formula that nourishes normal to dry hair, without weighing it down. Infused with fine coconut oil, the formula intensely nourishes, leaving hair feeling irresistibly soft whilst indulging your senses with an addictive coconut fragrance. Apply on wet hair, lather then rinse. 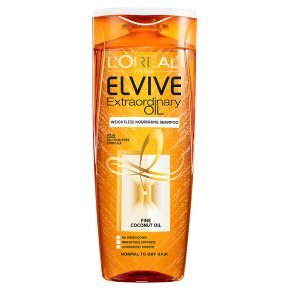 Follow with Extraordinary Oil Weightless Nourishing Conditioner. For even more nourishment, apply Extraordinary Oil Multi-Use Nourishing Balm as an intensive conditioning treatment in shower, or as a leave-in treatment before styling. In case of contact with eyes, rinse them immediately and thoroughly.